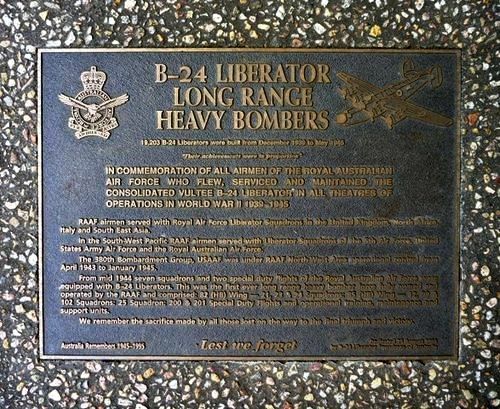 Plaque commemorates the personnel who served in B-24 Liberator Long Range Heavy Bombers during World War Two. "Their achievements were in proportion". In commemoration of all airmen of the Royal Australia Air Force who flew, serviced and maintained Consolidated Vultee B-24 Liberator in all theatres of operations in World War II 1939-1945. RAAF airmen served with the Royal Air Force Liberator Squadrons in the United Kingdom, North Africa, Italy and South East Asia. In the South-West Pacific RAAF airmen served with Liberator Squadrons of the 5th Air Force, United States Army Air Force and the Royal Australian Air Force. From mid 1944 seven squadrons and two special duty flights of the Royal Australian Air Force were equipped with B-24 Liberators. This was the first ever long range heavy bomber force fully owned and operated by the RAAF and comprised : 82 (HB) Wing - 21, 23, & 24 Squadrons: 85 (HB) Wing - 12, 99 & 102 Squadrons : 25 Squadron : 200 & 201 Special Duty Flights and operational training, maintenance and support units. We remember the sacrifice made by all those lost on the way to the final triumph and victory.